What is a Broken Pelvis or Pelvic Fracture? The pelvis is the large bony ring-like structure at the base of the spine that connects to the upper legs or femur. Essentially, it is the lower part of the torso that protects the intestines, bladder and the reproductive organs. The pelvis is crucial for our balance which affects how we walk, run and move around. 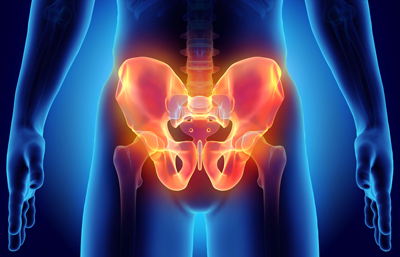 Pelvic fractures can range from mild to severe depending on the type of accident that caused it. They are classified as either stable or unstable. A stable fracture is when there is one break point in the pelvic ring with limited bleeding and the bones have remained in place. An unstable fracture is one in which there are two or more breaks in the pelvic ring with moderate to severe bleeding. Elderly people with osteoporosis are more at risk of fracturing their pelvis if they fall or are in a traumatic accident. Even though a pelvic fracture can be diagnosed by the symptoms the patient is having, typically a doctor will order an X-ray or a CT scan to determine the severity of the injury. Treatment will depend on how bad the fracture is and whether it’s a stable or unstable fracture. A minor fracture in a healthier or younger person can be treated with just bed rest, prescription medication and physical therapy. A more severe fracture will most likely require surgery to reconstruct the pelvis and restore stability so the patient can get back to living their normal life. A severe or an unstable fracture of the pelvis can be life-threatening. Depending on the speed or impact of the accident there could be internal bleeding and internal damage to the organs. In cases like this the patient will need to be stabilized first. Multiple surgeries will likely be performed and after there will be a long road to recovery that will include routine physical therapy and rehabilitation. Our attorneys at Jim Dodson Law have successfully handled pelvic fracture cases caused by motor vehicle accidents, bicycle and pedestrian collisions, as well as falls. It’s important to keep in mind that serious injury claims rarely settle for the full value without the help of an experienced lawyer who has dealt with such cases. The victim needs to recover fully from their injuries in order to know what their settlement is worth. If you are suffering from a pelvic injury due to someone else’s carelessness, contact our law office to schedule your free consultation or call us directly at 888.207.0905. We are here to help you obtain the compensation you deserve to recover from your injuries.